You’re not sure what souvenir you should get for your friends and family while you’re in Berlin? We’ve got you covered! The whole reason we started of/Berlin, you know, was to offer an alternative to standard Berlin souvenirs – great products from local designers and manufactories, that we’d like to buy ourselves. 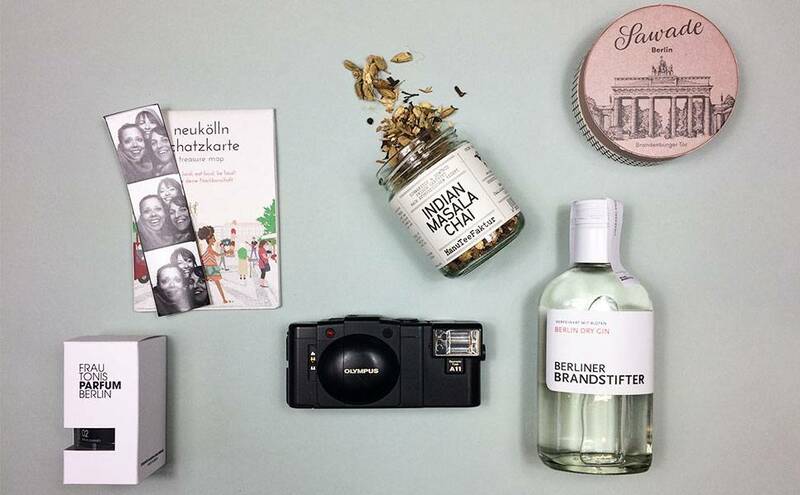 So in this article we’ll present you the top 10 most popular souvenirs from Berlin, that’ll definitely remind you of the great time you’ve had during your visit. A real classic! Sawade is the oldest chocolate manufactory in Berlin. Since 1880, Sawade offers fine, handmade pralines without using any preservatives. Once the beautifully designed box is empty, it can be used for jewelry or other beloved things. Such a delicious, mild gin that comes straight out of Berlin. Every bottle is filled and numbered by hand, making this gin a perfect gift for the special people in your life. Berlin party nights are too special to be preserved, that’s for sure! However, taking a picture with your friends in one of the famous photo booths comes pretty damn close. Here’s an overview where you can find them. The absolute best choice when you’re traveling with limited luggage space. The push bowl is completely flat, but turns into a beautiful bowl when you start pushing your fingers into the metal. Manu Kumar’s own interpretation of traditional tea variations are all hand-blended and roasted in his manufactory. The ManuTeeFaktur is known for its delicious, organic teas that are always a good idea. The best proof of Berlin actually being a Mediterranean city (just a lot colder...): the vibrant Turkish market in Kreuzkölln. You’ll find everything there! Fruit & vegetables, yummy fast food, fabrics, handmade products from local manufacturers and great street music. The tote is still Berlins most popular bag. This one is particularly pretty. A very durable bag, made from 100% organic cotton and a silkscreen printed neon circle in the center. Your friends will love it (And you will too…)! Not your average Berlin vodka! This vodka tea infusion kit is the result of a cooperation between two of our partners: our/Berlin vodka and Paper & Tea. When infusing the delicious and mild vodka with fine and tasty tea, you’ll experience a drink, you’ve never had before. Ok, I think we can all agree on one thing: Berlin’s a pretty amazing place! Berlin summers, however, are especially cool. What a great idea of Frau Tonis Parfum to create a scent that smells like a warm summer in Berlin – fresh, juicy, just like everything’s possible. The ultimate Berlin souvenir (even if it’s a little bit heavier than the other stuff…): a “plattenbau” made from concrete – what’s more Berlin than that, huh? And don’t worry, you don’t have to carry it, we’re happy to send your new products straight home to your place. Need more inspiration? Check out our webshop for more products from Berlin. This article has also been published on one of our favorite local blogs: Awesome Berlin.